With 48 years of experience and dozens of awards in the bag, KEF is already a much-revered loudspeaker brand in the world of home cinema. And having spent some quality time with it new XQ series, I can safely say that its rep will remain intact. Some might argue that the XQs are KEF's most innovative speakers to date, and we've assembled here the most desirable configuration, with three-way towers at the front (XQ40s), two-way bookshelf speakers at the back (XQ20s, a remarkably highly-specified centre channel (XQ50c) and a 12in subwoofer (XQ60b). This setup will typically sell for around £5,000, but it's quite possible to build a more affordable system by choosing the slimmer tower speakers (XQ30s) and smaller rears (XQ10s) instead. All six of the XQ siblings sport curved wooden cabinets without a right angle in sight. It might look flat in the picture, but try and balance a coffee cup on top of any of these boxes (as if you would) and it'll slide gracefully onto the floor. We've chosen the lustrous Piano Black lacquer finish, but Birdseye Maple and beautiful Khaya Mahogany real wood veneers are also available. And crucially, they all use KEF's trademark Uni-Q driver array that puts the tweeter in the centre of the mid-bass driver. It's this arrangement that gives KEF speakers their effortlessly integrated sound, which is still apparent and even enhanced by the Tangerine waveguide of the XQs, which disperses the highest frequencies through a metal device that crowns each tweeter. The tweeter itself now boasts a dynamic range wide enough to replace the odd-looking hypertweeters that KEF used to mount on top of its reference-quality cabinets. 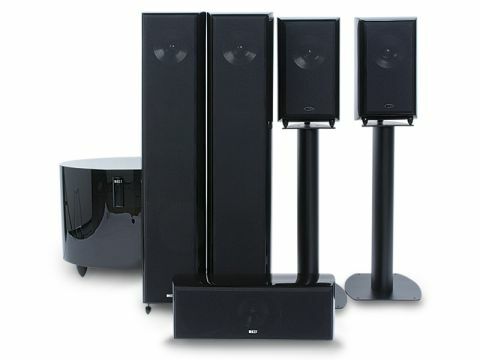 The stars of the show are clearly the hulking XQ40 floorstanders, which stand chest-high on conical metal feet. Behind the magnetic grills are two paper cone drivers for the low frequencies and an aluminium Uni-Q driver for the high frequencies. This three-way arrangement promises a particularly wide dynamic range with the big enclosure enabling deep bass extension and the hypertweeter reaching the very high frequencies. It looks like no expense has been spared on these statement speakers; tap the front bezel and you'll notice the whole front plate has been engineered from a single piece of aluminium with holes machined into it for the three drivers and two air ports. With the extra rigidity that this brings to the enclosure, combined with the absence of any parallel walls that could create unwanted internal standing waves, these boxes can muster a truly rich and resonant bass. You can further tune the cabinets to suit your room by stuffing one or both of the foam bungs into the front ports. Even before unpacking the others, these two tower speakers were able to flood my listening room with their astonishing presence in stereo mode. Feed them a well-recorded vocal track like those of Air's Moon Safari album, close your eyes and you'll swear the singer is standing between the two XQ40s. KEF has always maintained that the centre channel is the most important speaker in a surround package, and the XQ50c is as extravagantly manufactured as the front pair, with an aluminium bezel, acres of glossy black lacquer and a similar driver array. It's not small, though, so you can forget about wall-mounting. Instead you'll need a sturdy support of the right height to bring it into line with the XQ40s. A rubber mat is provided to lay it on top of the stand. The substantial rears are of similarly heroic build, but reduced to stand-mountable proportions – KEF will flog you some suitable metal supports to go with them. With its oval design, the XQ60b sub is an aesthetic match for the rest of the XQ series. Driving the 12 inch cone is a 200W amp. It looks deceptively simple, with just volume and phase control dials visible at the back and there's no remote control, but it'll turn itself off when there's no signal. Despite their size, these big boxes are surprisingly accommodating. The XQ40s are sensitive at 90dB and easy to drive with a moderately powerful amplifier. My Marantz SR6003 had no trouble pushing all five speakers at quite inconsiderate volume levels. Yet as these KEFs have their ports facing forwards, they don't mind being pushed back against the walls if you need the space. Aligning the front three is a little more critical because you'll want to maintain the XQ40's stereo imaging, while allowing the centre channel to deliver dialogue and centre stage noises as seamlessly as possible. The centre unit has the same attention to detail and open mid-range as the main pair, so the front soundstage is unbroken and as clear as Evian. It doesn't have quite the bass extension, but an impressive dynamic range, and it doesn't take much tuning to get all of the front speakers filling your cinema in harmony. The rear XQ20s would make a decent pair of hi-fi speakers, and in a 5.1 array they're more than adequate at filling in the rear soundstage and blending it with the front. And it's here that the Tangerine waveguide is particularly welcome, with the high frequencies coming through diffuse and integrated. Together the XQs manage the ideal blend of deep bass, spacious mid band and treble. A neutral balance like this suits all genres of film, but that resonant low-end works particularly well with action flicks. Cue Watchmen on Blu-ray, and the graceful and beautifully dubbed fight scene in Chapter One. This gives the XQ speakers a chance to show just how much air they can shift between them. There's plenty of crunching detail, but it's never harsh or brittle – just thumpingly accurate. And the advantages of that weighty and precise centre channel come into play during these loud passages by delivering voices through the mix, so you never miss any dialogue. Try a more tuneful soundtrack, like Across the Universe on Blu-ray, and the reworked Beatles tracks that pepper the film (sorry about the pun) are presented with real musicality. The fast, rhythmic bass and sweet treble gives the impression that these speakers were tuned with music in mind. In fact, this is when they impress the most. Playing a classical piece in surround sound (in this case Tchaikovsky's Classics from a DTS collection on DVD Audio) and the presence and scale of these loudspeakers is ideal for conveying the sound of a full orchestra. Sonically, it's hard to fault with these gorgeous cabinets, because their natural tone is so universally appealing. I could complain about the lack of a remote control for the sub, or the option to tri-wire the front pair, but really, the XQ series are outstanding all-round performers.